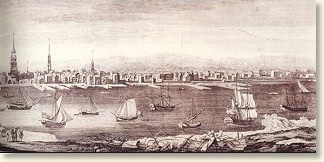 At the end of the seventeenth century approximately 200,000 people inhabited the British colonies in North America. The following century saw an explosion in numbers with the population doubling about every 25 years. The majority of these new immigrants were Scotch-Irish, Germans or African slaves. Between 1700 and the beginning of the American Revolution, approximately 250,000 Africans, 210,000 Europeans and 50,000 convicts had reached the colonial shores. The passage to America was treacherous by any standard. Many of the immigrants were too poor to pay for the journey and therefore indentured themselves to wealthier colonialists - selling their services for a period of years in return for the price of the passage. Crammed into a small wooden ship, rolling and rocking at the mercy of the sea, the voyagers - men, women and children - endured hardships unimaginable to us today. Misery was the most common description of a journey that typically lasted seven weeks. "Few of this class escape with their lives." "...during the voyage there is on board these ships terrible misery, stench, fumes, horror, vomiting, many kinds of seasickness, fever, dysentery, headache, heat, constipation, boils, scurvy, cancer, mouth rot, and the like, all of which come from old and sharply-salted food and meat, also from very bad and foul water, so that many die miserably. Add to this want of provisions, hunger, thirst, frost, heat, dampness, anxiety, want, afflictions and lamentations, together with other trouble, as e.g., the lice abound so frightfully, especially on sick people, that they can be scraped off the body. The misery reaches a climax when a gale rages for two or three nights and days, so that every one believes that the ship will go to the bottom with all human beings on board. In such a visitation the people cry and pray most piteously. No one can have an idea of the sufferings which women in confinement have to bear with their innocent children on board these ships. Few of this class escape with their lives; many a mother is cast into the water with her child as soon as she is dead. One day, just as we had a heavy gale, a woman in our ship, who was to give birth and could not give birth under the circumstances, was pushed through a loophole (porthole) in the ship and dropped into the sea, because she was far in the rear of the ship and could not be brought forward. Children from one to seven years rarely survive the voyage; and many a time parents are compelled to see their children miserably suffer and die from hunger, thirst, and sickness, and then to see them cast into the water. I witnessed such misery in no less than thirty-two children in our ship, all of whom were thrown into the sea. The parents grieve all the more since their children find no resting place in the earth, but are devoured by the monsters of the sea. It is a notable fact that children who have not yet had the measles or smallpox generally get them on board the ship, and mostly die of them. When the ships have landed at Philadelphia after their long voyage, no one is permitted to leave them except those who pay for their passage or can give good security; the others, who cannot pay, must remain on board the ships till they are purchased and are released from the ships by their purchasers. 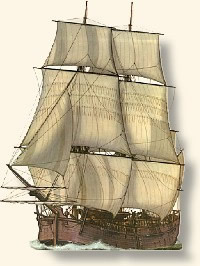 The sick always fare the worst, for the healthy are naturally preferred and purchased first; and so the sick and wretched must often remain on board in front of the city for two or three weeks, and frequently die, whereas many a one, if he could pay his debt and were permitted to leave the ship immediately, might recover and remain alive. The sale of human beings in the market on board the ship is carried on thus: Every day Englishmen, Dutchmen, and High German people come from the city of Philadelphia and other places, in part from a great distance, say twenty, thirty, or forty hours away, and go on board the newly-arrived ship that has brought and offers for sale passengers from Europe, and select among the healthy persons such as they deem suitable for their business, and bargain with them how long they will serve for their passage money, which most of them are still in debt for, When they have come to an agreement, it happens that adult persons bind themselves in writing to serve three, four, five, or six years for the amount due by them, according to their age and strength. But very young people, from ten to fifteen years, must serve till they are twenty-one years old. Many parents must sell and trade away their children like so many head of cattle, for if their children take the debt upon them- selves, the parents can leave the ship free and unrestrained; but as the parents often do not know where and to what people their children are going, it often happens that such parents and children, after leaving the ship, do not see each other again for many years, perhaps no more in all their lives. When a husband or wife has died at sea, when the ship has made more than half of her trip, the survivor must pay or serve not only for himself or herself, but also for the deceased. When both parents have died over halfway at sea, their children, especially when they are young and have nothing to pawn or to pay, must stand for their own and their parents' passage, and serve till they are twenty-one years old. When one has served his or her term, he or she is entitled to a new suit of clothes at parting; and if it has been so stipulated, a man gets in addition a horse, a woman, a cow." "Passage To America, 1750," EyeWitness to History, www.eyewitnesstohistory.com (2000).